Complete pricing isn't available yet, but the base model is nicely priced. However, we recommend opting for the mid-range SL model so you can get the safety features of the Technology package. After rotting on the vine for years, the 2017 Nissan Armada's redesign brings it upscale and makes it competitive with its recently updated truck-based full-size SUV rivals. The second generation of the Nissan Armada has taken its time coming to the U.S. The first version emerged in 2004, a spin-off of the Titan pickup truck, and it lasted through the 2015 model year, an eternity in the dealer showroom. With the 2017 Armada, Nissan has adopted what is basically a U.S. version of the global Nissan Patrol SUV. The new Armada is a soulmate of the Infiniti QX80 once again, with a body-on-frame design and its eight-passenger seating. To distinguish it from the QX80, it gets new styling and new engineering, plus additional safety features. Under the hood it features the new 5.6-liter Endurance V-8 making 390 horsepower (up from 317) and 394 pound-feet of torque (from 385). Compared to the outgoing 5.6-liter V-8, this engine features direct injection and Nissan's VVEL (Variable Valve Event and Lift), which has variable valve timing and variable valve lift for both the intake and exhaust sides. It is mated to a new 7-speed automatic transmission (instead of a 5-speed) with downshift rev matching. The V-8 is more than enough engine. It gets the Armada moving briskly, has plenty in reserve for passing and towing, and it sings a great V-8 tune that is reserved during cruising but makes itself known under hard acceleration. Nissan isn't sharing 0-to-60-mph times but it should be in the 6.5-second range. That's pretty quick for such a large vehicle. 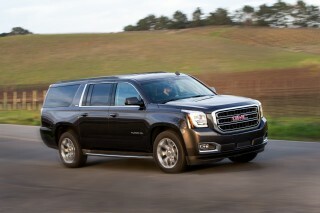 Fuel economy increases slightly to a best of 14 mpg city, 19 highway, 16 combined with rear-wheel drive. Rear- and four-wheel drive are offered. 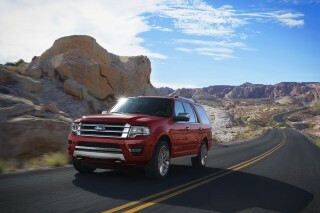 The 4WD system has low-range gearing and can send 50 percent of the torque to the front wheels when it detects slip. Properly outfitted, the 2017 Nissan Armada can tow up to 8,500 pounds. On the road, the Armada can't shed the effects of its considerable weight. It leans noticeably in turns and the steering is slow but fairly direct. It's a bit better controlled than most rivals and ride quality is good, but this is not a vehicle that invites aggressive driving. The new Armada rides a wheelbase that is 2.1 inches shorter than the outgoing model, yet it is 1.2 inches longer, 0.6 inch wider, and it sits 2.2 inches lower. Inside, the Armada offers seating for eight with second- and third-row bench seats. The two rear rows fold in a 60/40 split. Second-row captain's chairs are available that reduce seating capacity to seven. The cabin is a much nicer place to be than it was in the last Armada. Acoustic glass for the windshield and front side windows, and additional sound deadening material give the interior what Nissan calls "library levels" of interior noise. Interior space is plentiful in the first and second rows, though we wish the driver's seat had more range of motion in its adjustments. The rear seat is easy to get to but hard to live in. Cargo space is quite usable and rather generous for the class. The 2017 Nissan Armada is offered in SV, SL, and Platinum trim levels, each with rear- or four-wheel drive. For a starting price around $45,000, the SV is well equipped with an 8.0-inch touchscreen with a navigation system, heated front seats, a 13-speaker Bose audio system, and 18-inch alloy wheels. The SL model offers such niceties as leather upholstery, dual-zone automatic climate control, a power third-row seat, Nissan's surround-view camera system, a power liftgate, and 20-inch wheels. The Platinum gets a sunroof, heated and ventilated front seats, a heated steering wheel, heated rear seats, rear DVD entertainment with two 7.0-inch screens, and a suite of safety features that includes with forward collision warning, backup collision prevention, lane departure warning and active lane control, and a surround-view camera system with moving object detection. Other safety features include the usual airbags, a rearview camera, front and rear park assist, and active front head restraints. The 2017 Armada has not yet been crash tested. The 2017 Nissan Armada balances a bulky, macho appearance with luxury cues. The 2017 Nissan Armada takes on a completely different look than its predecessor. Actually, the sheet metal comes from the Nissan Patrol, with only tweaks made for America. 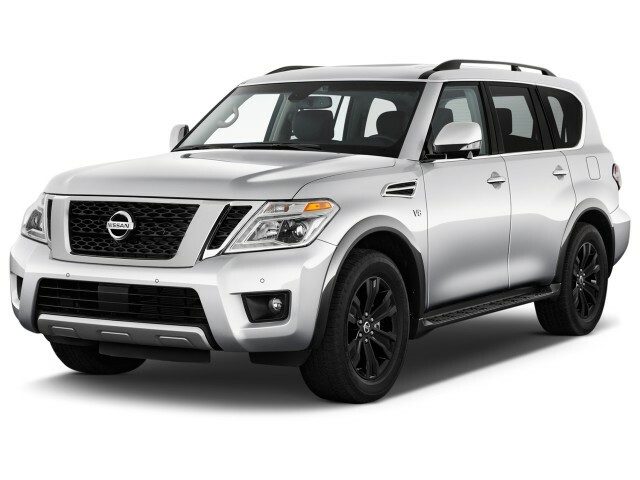 Up front, the Armada features a bold, chromed version of Nissan's "V Motion" grille. LED headlights and daytime running lights are standard, and fog lights are standard on the SL and Platinum models. Functional air intakes are located in the front fenders, and all four fenders have contrasting paint on the wheel flares. Perhaps the most noticeable feature of the Armada is the unique side window line, which angles sharply at the rear and imparts a sense of motion. Wheels are 18s on the base model with 20s for the others. 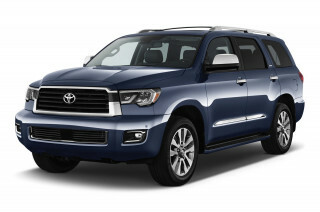 At the rear, the Armada has LED taillights and a prominent bumper than contributes to the Armada's 5-inch length advantage over the Chevrolet Tahoe. The overall look is predictably macho, though it also adopts some of the soft, organic shapes of the Infiniti QX80. The contrasting fender flares and the chrome around the windows give it an upscale appearance. That upscale look extends to the interior, where the Armada features more substantial soft-touch materials than in the past. The design is straightforward, with an 8.0-inch touchscreen on the center stack and a bevy of buttons and controls below it. Slow steering and slugish handling are the penalties for the 2017 Nissan Armada's heft and towing capability. With its Patrol body and QX80 frame, the 2017 Nissan Armada rides on some pretty serious hardware. The boxed frame is larger in key areas, increasing from 2.4 to 3.9 inches in height. All told, bending stiffness increases by 20 percent. To that ladder frame Nissan mounts double wishbone suspensions front and rear, as well as a load-leveling rear air suspension. That's not necessarily the case off road. 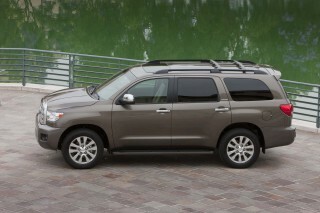 When equipped with four-wheel drive, the Armada has decent off-road capability. It's stiff structure keeps it from bending, and the available low-range gearing and hill descent control optimize traction for tricky situations. Like its predecessor, the 2017 Nissan Armada is powered by a 5.6-liter V-8. However, numerous updates give this engine more power. Horsepower increases considerably from 317 to 390, and torque increases modestly from 385 to 394 pound-feet. Most of those gains can be attributed to higher compression and the addition of direct injection and variable valve timing and lift. The 5.6 is also now mated to a 7-speed automatic transmission that replaces the old 5-speed automatic. On the road, the V-8 is more than enough engine. It gets the Armada moving briskly, has plenty in reserve for passing and towing, and it sings a great V-8 tune that is reserved during cruising but makes itself known under hard acceleration. Nissan isn't sharing 0-to-60-mph times, but it should be in the 6.5-second range. That's pretty quick for such a large vehicle. All that power offers plenty of towing capability as well. The Armada boasts a class-leading 8,500-pound max towing capacity, which bests the Toyota Sequoia's 7,400 pounds and the 6,600 pounds of the Chevrolet Tahoe and Ford Expedition. Max towing capacity is actually down from the 9,000 pounds of the last model, perhaps due to additional weight gained with this generation. The Armada has great space for people and cargo, but the third row is a penalty box. With its 2017 redesign the Armada moves decidedly upmarket, and that is reflected in the interior materials and amenities. The Platinum model we drove featured a cockpit that could rival most luxury vehicles, including the Armada's cousin from Infiniti, the QX80. The materials all look good and feel substantial, even if the wood trim is really plastic. The acoustic glass windshield and front windows, and additional sound deadening material gives the interior what Nissan calls "library levels" of interior noise, and makes normal conversation easy. Nissan outfits the Armada quite well, too. Even the base model has heated front seats, a navigation system, and a 13-speaker Bose audio system. This big SUV also has plenty of space. Nissan offers two seating configurations. The standard setup is for eight occupants with 60/40-split folding second and third rows. The Platinum model offers second-row captain's chairs. The Platinum also comes with a power-folding third row that takes almost 16 seconds to power up or down, which seems like an eternity. The driver is perched high on the front seat, and we found that it doesn't have enough range of motion for those who like to tilt the front of the seat bottom up and the back down. Otherwise, the front seats are comfortable and offer plenty of space for just about anyone. Nissan boasts that the second-row seats has best-in-class head room and leg room. All that space does make for comfortable seating, especially with the available captain's chairs and their accompanying center console. With either configuration, the second-row seats fold and tilt forward to offer fairly easy access to the third row. Unfortunately, the third-row bench is a penalty box. Adults will sit with their heads scraping the ceiling, and their knees up and pinned against the second-row seats. The switch to the Patrol platform hurts here; the third row loses 3 inches of shoulder room and 4 inches of leg room. Back-row passengers will not be pleased, especially if you try to fit three across—they had better be skinny and like each other. The second- and third-row seats fold down to open up a cavernous 95.4 cubic feet of cargo space. That drops to a still very useful 49.9 cubic feet (about the max size of a compact SUV) with the third-row folded. With all the seats up, there is still a decent 16.5 cubic feet of space. That's about the size of a trunk of a midsize sedan, but you'll probably only want to use half of that space to leave room to see out the back. While these numbers are competitive, it should be noted, that they are all down by a few cubic feet from the outgoing model. The Armada gains a lot of active safety features for 2017, but it hasn't been crash tested. The 2017 Nissan Armada comes with the usual safety features, including three-row curtain-side airbags. Active front head restraints and a rearview camera are also standard. A surround-view camera system that shows a 360-degree view of the surroundings is standard on SL and Platinum models. Those who opt for the Technology package get adaptive cruise control, distance control assist, forward collision alert with automatic emergency braking, blind spot monitors, and backup collision prevention. The forward collision warning system can read two cars ahead. Platinum buyers get those features, plus lane-departure warning and active lane control. An improved feature set and more amenities make the 2017 Nissan Armada more competitive against recently updated rivals. The 2017 Nissan Armada is offered in SV, SL, and Platinum trim levels, each with rear- or four-wheel drive. Standard features on the SV model include cloth upholstery, four-way power-adjustable front seats, heated front seats, 60/40-split folding second- and third-row seats, an 8.0-inch dashboard screen, a navigation system with traffic and weather information, a 13-speaker Bose audio system, satellite radio, roof rails, side steps, auto-leveling rear air suspension, and 18-inch alloy wheels. The exterior mirrors also have "hospitality lighting," which turns on the puddle lights when the driver approaches the vehicle, then turns on the interior lights when the vehicle is unlocked. 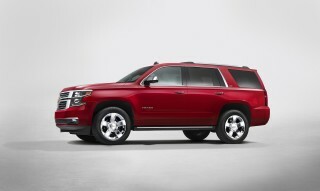 A Driver Package for the SV includes front fog lights, an auto-dimming rearview mirror, a power-folding third-row seat, a power liftgate, a trailer towing harness, and a connector for a brake controller. The SL adds leather upholstery, dual-zone automatic climate control, keyless ignition, remote starting, a power-folding third-row seat, a surround-view camera system, a power liftgate, foglights, and 20-inch wheels. SL buyers can opt for a sunroof and a Technology Package that includes adaptive cruise control, distance control assist, forward collision warning with automatic emergency braking, blind-spot monitors, active lane control, and backup collision prevention. The Platinum gets a sunroof, heated and ventilated front seats, a heated steering wheel, heated rear seats, rear DVD entertainment with two 7.0-inch screens, the safety features from the Technology package, and lane departure warning with lane departure prevention that helps from merging into other cars. Platinum customers can also get second-row captain's chars with a center console instead of the rear bench. The 2017 Nissan Armada's power and weight translate to poor fuel economy. Most of the features that improved the 5.6-liter V-8's power also aid fuel economy, especially the direct injection and variable valve timing and lift. However, this 5,576 to 5,973-pound behemoth isn't fuel efficient. Nissan estimates fuel economy ratings of 14 mpg city, 19 highway, 16 combined with rear-wheel drive and 13/18/15 mpg with four-wheel drive. Those numbers will mark a slight increase from the outgoing model's figures of 15 mpg combined with rear drive and 14 mpg combined with 4WD. It's worth noting that the mechanically identical Infiniti QX80 manages 1 mpg better in both highway scores.